Chocolate I haven’t been eating for some time. And I really don’t miss it. Castles are just an occasional treat – well, I do love a good ruin. And though I rarely have cake, the mere sight of a good one makes me pine. Still, I can resist. But as for Moomins – who can resist a Moomin? 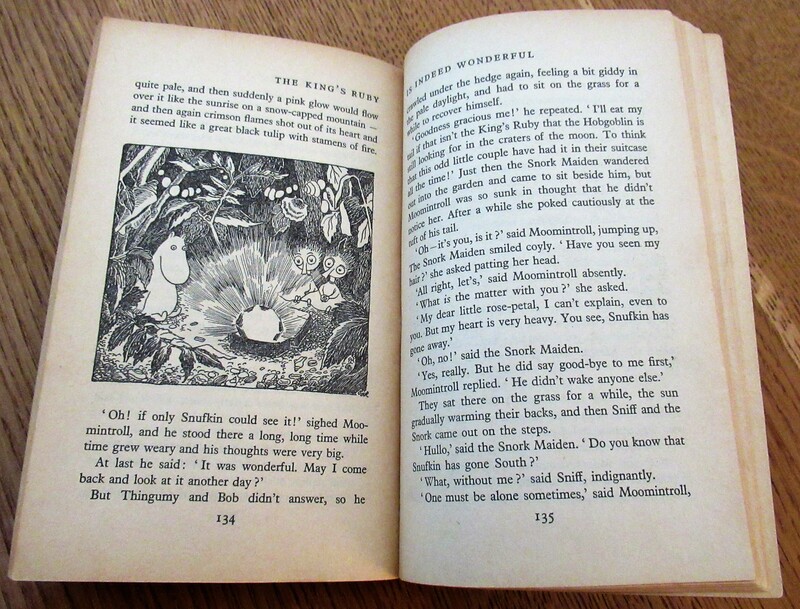 My first encounter with Moomintroll, his assorted friends and relatives – as well as some terrors – was as a small child. 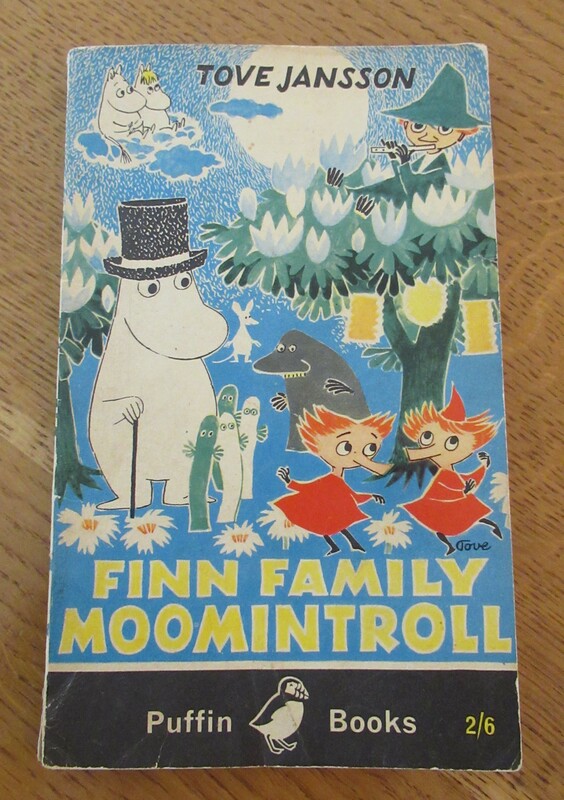 My parents read Tove Jansson’s Finn Family Moomintroll to me at bedtime. Oh, how I longed to see the King’s Ruby gleaming in the dark. And thanks to Ms Jansson’s evocative black-and-white pictures, I could easily imagine it. The book went missing and it wasn’t till I was eleven that I bought a new copy, with saved-up pocket money. I still have my well-thumbed and precious Puffin paperback. My favourite character is the magical-black-top-hatted Hobgoblin. Although Thingumy and Bob, who communicate in a lange stranguage, are also cholly jaracters. The Hobgoblin appears at first to be BAD, but turns out just to be SAD. And really rather nice inside when Bingumy and Thob are kind to him. Isn’t that so often the way? Bad people are just sad people in disguise? Anyway. Being in Sweden, which is nearer to Finland than England is, Moominalia is available to buy. It was on my last trip, as I walked through the shopping area, that I first came across the sweet shop. Great, glittering, heaps of cellophane-wrapped nougat – one of my favourite confections – lay, siren-like in the window. But bravely I marched past – and found a toyshop. 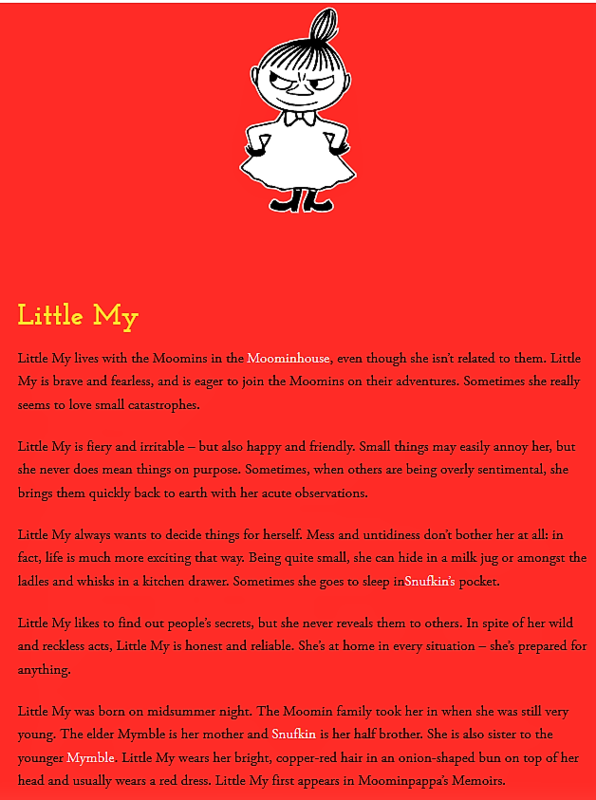 Wherein – oh joy – were not just toys, but plates, cups, bowls and other such Moominaceous stuff. I bought a plastic plate. And felt a bit selfish. It wasn’t cheap. Nothing in Sweden is, especially since our Brexit decision. But this time, as the Prof and I together wandered the after-dark streets, the sweet shop window had a special surprise for me. 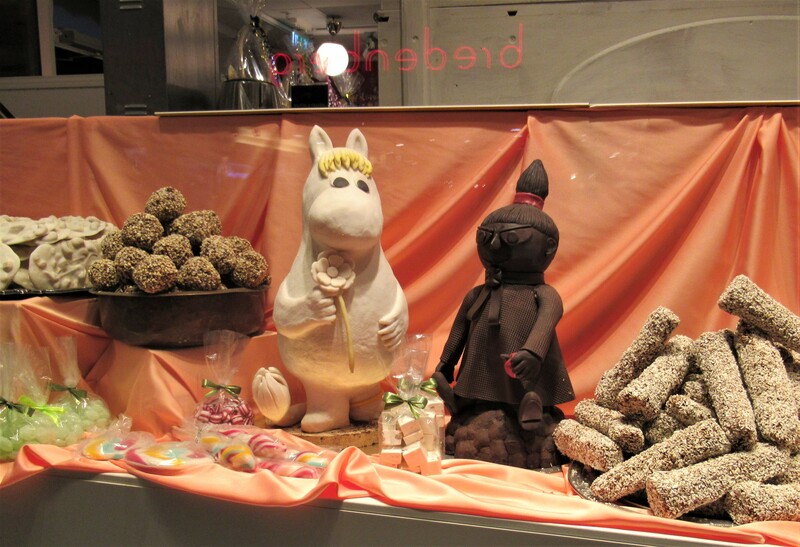 Moomin’s friend the Snorkmaiden and Little My, in chocolate. We tore ourselves away from the chocolate and made it to the sleeping toyshop, which had a wonderful display in each window. One featuring a rather lovely fox, the other a whole Moomin world. Which would have to wait for another day. Because even for humans, it was time to make ready for bedtime – and first, to eat. We pounded the streets for quite some time after that, searching for a place to dine. And finally found an old Italian restaurant with old-style Italian food. The night was quiet in our tiny room and the breakfast options brimming with choice. Though I never did make my own waffle, as I intended, so enticed was I by the smoked salmon and mustard sauce. For the next two days we walked, took buses, experiencing people, places and things. The second night’s meal was the punctuation lobster – followed by the less poetic but delicious Arctic Char. Which reminded me of the train timetable in Uppsala, which offers trains to ‘the Arctic Circle’. Oh, how romantic that sounded. But back to the Char. Anyway. I love food. I really do. So it’s no surprise that on day three, when we visited the Castle – where we had eaten a perfect lunch of soup and endless salad on our last trip – we treated ourselves to cake. It was a dreary, drippy, Sunday. And, I must confess, not only did I succumb to cake, I had warm chocolate. See, that warm is the odd thing. It happened in Poland too. We in England do hot chocolate. In Sweden and Poland they do warm (barely) chocolate. In fact, the warm chocolate in Poland was exactly that – chocolate, warmed to a gloopy liquid state. At least in Sweden it was milky. I’ve never eaten such a luscious cake. Sugar paste. And all beautifully decorated, a dusty decorous pink. 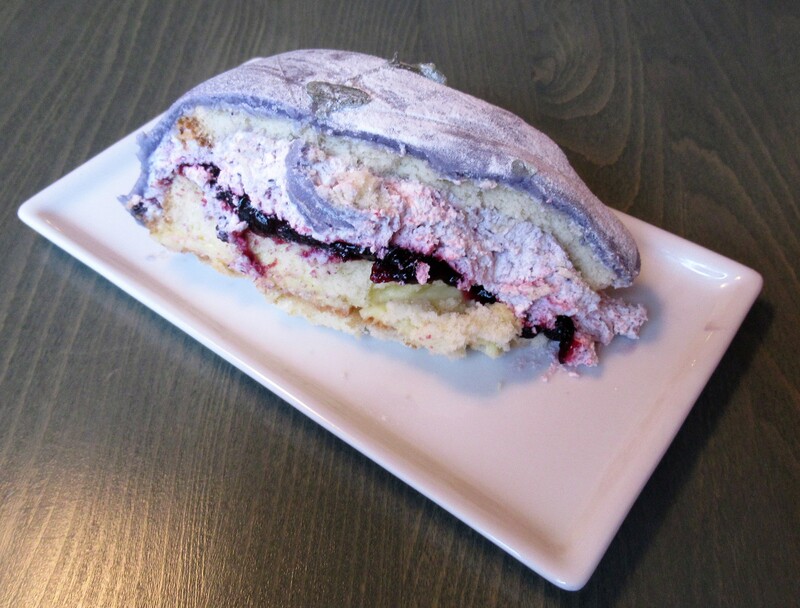 It was called a princess cake – and it was fit for one. Anyway. 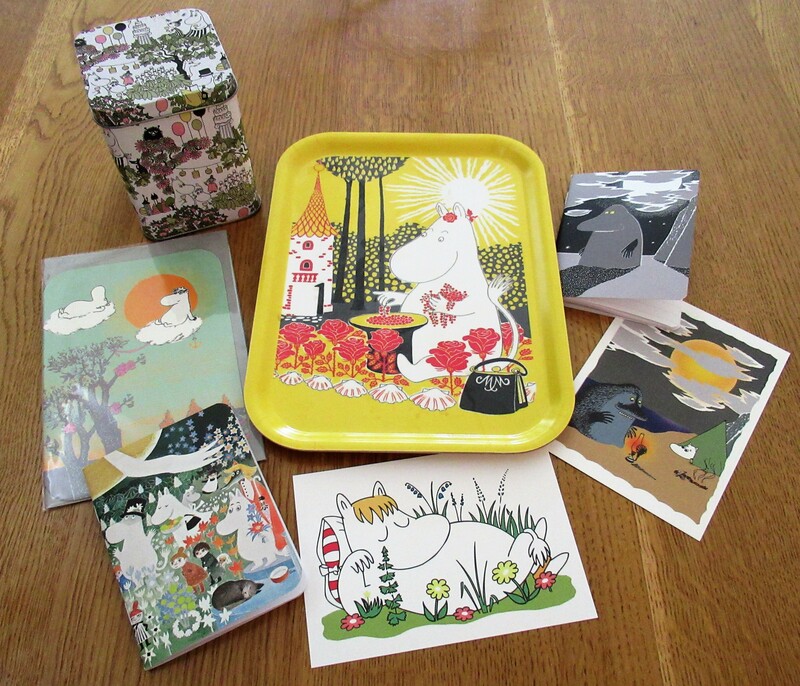 Shall I tell you what we bought in the Moomin shop? Just a tiny tray. Made of birch wood, in Finland. Sunshine yellow, to carry my morning cup of tea and cheer my start to the day. But … then we made another find. In an academic bookshop. I restrained myself from even considering the bigger items – which were really expensive. And, anyway, little things are just as good as big things. Sometimes better, as Little My would probably agree. So now we have our Malawi tea in a Moomin tin. And I have a precious card that one day someone might (hmm) receive. And a Moominvalley notebook, for little notes. But I swept up a Groke notebook at the last minute to remind me. Even in Moomin world, sometimes bad things are – bad. But cake – and even warm chocolate – can be relied on to make the world feel better. This entry was posted in Art, jaunts & going out, Sweden, Travelling and tagged Arctic Char, Hobgoblin, King's Ruby, Little My, Malawi tea, Princess cake, Snorkmaiden, Snowdonia, the Groke, Thingumy and Bob, Uppsala castle. Bookmark the permalink. 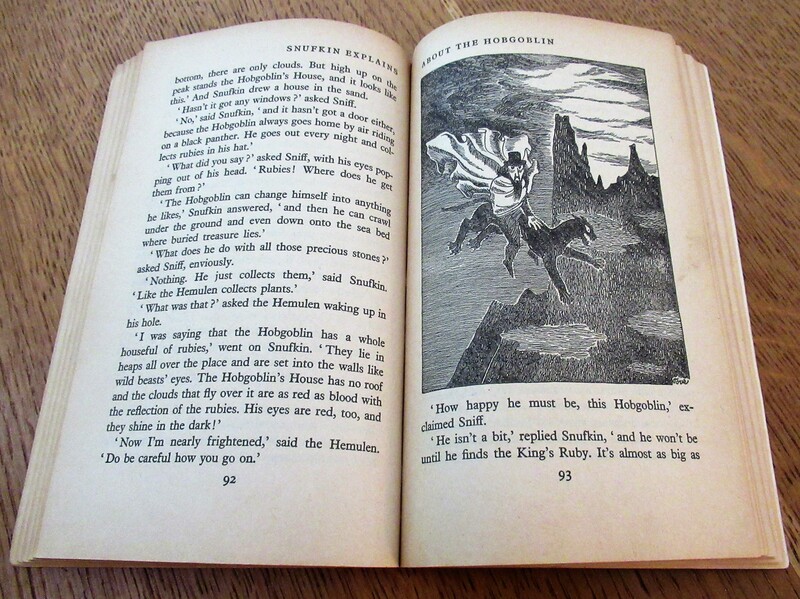 Nothing is as wonderful as finding a copy of a beloved childhood book that was lost 9and hanging on to it forever) Delightful that there are places where imagination and rich vocabulary are alive in literature for children – and celebrated by adults, too. Oh, good choice with the small things…small things can be tucked away and end up being saved – and treasured if a final move is made when very old and there’s only space in the small room for a few things. And useful too – the tray for carrying as well as joy, the little notebooks for notes – and the cards to keep in touch with others. Oh and tea, of course. Keeping my tea fresh. Memories are good but sometimes it’s nice to have aide memoires! Thanks for dipping in to Moomin world! Is the char the same as the omble chevalier fished in Lac Leman and in the lakes in the Jura? I vaguely remember being told that it was the arctic char which had become marooned in the mountain lakes in, or possibly after, the Ice Age. Whatever it was it was jolly good. 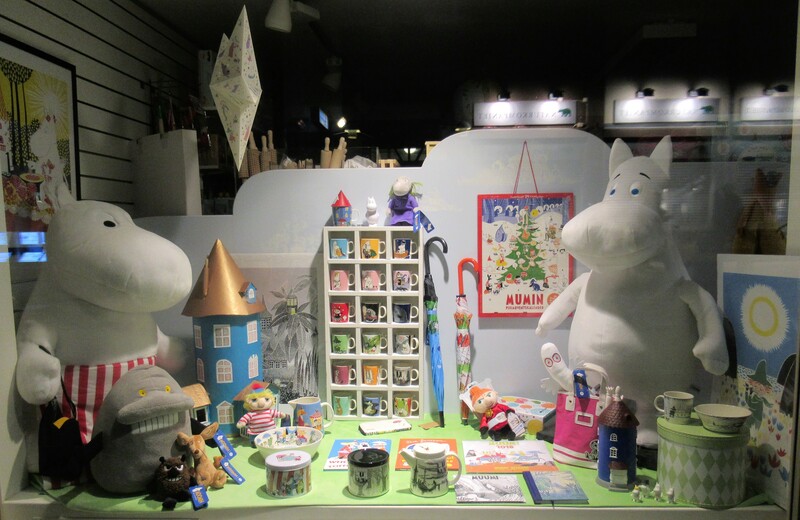 And what a delight to find that toy shop…all things Moomin! Goodness never heard of omble chevalier shall have to look it up. And I was simply reporting what I think I heard about the char in Wales, hmmm, Google beckons… And, yes, it was delicious, by the way. Glad you liked the shop window! I ate it when in the region years ago and remember both enjoying it and the story i was told about its origins. Oh yes….that shop window! Luckily for my purse I am not travelling much these days…I could be horribly tempted! Two words: Hemulen & Snufkin. These are my favourite characters – the ultimate collector and the wondering philosopher. 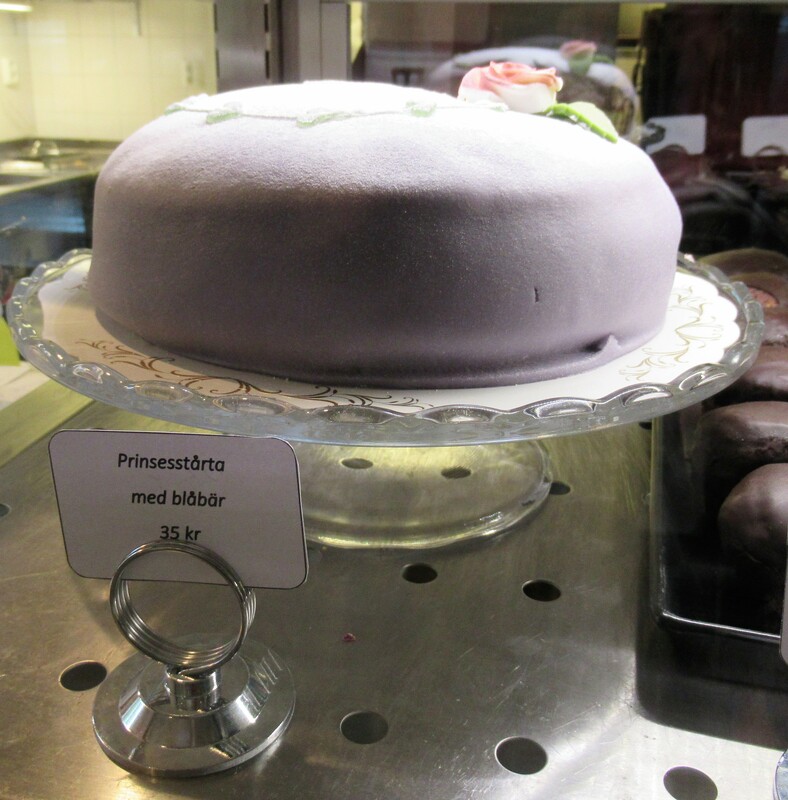 Love Princess cake (prinsesstårta). They are so pretty, but it really is difficult to make. Glad you got to those Moomins with the bonus of cake! Ha! Funnily, I have a sore wrist and was awake in the night and started thinking about Hemulen. A very sweet and admirable character. Snufkin – well, charming and a necessary component of life – a little unreliable but then so is everything in this world! They all have their charms, except the Groke! Do you think it was his teeth that made him so evil? Have you made a princess cake? Wow. It really was utterly delectable. No to the princess cake, but I’ve read the instructions and immediately backed away! My favourite bit with the Hemulen is when he is so despondent after finally collecting the last stamp to complete his collection and realised that his purpose in life was now blank. Luckily, he was persuaded to start collecting botanical samples (Linnaeus-like). I didn’t know these as a child, but read them all to my son when he was little. I absolutely love the language – even in translation. I am so amazed at the translation – Thingumy and Bob – what on earth was it in the original?! And yes, that is a lovely episode of the Hemulen. 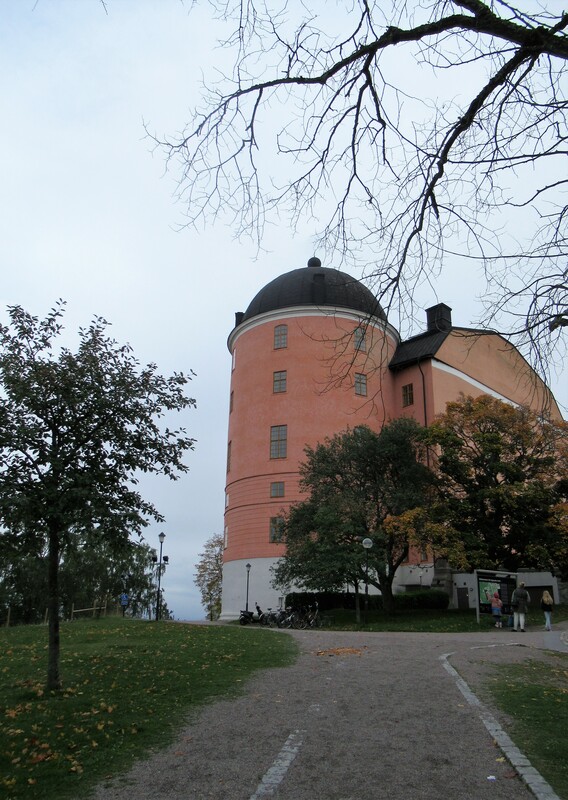 I have to confess that Moominland, like the past, is a foreign land to me. That cake sounds absolutely sinful. But the Malawi tea? I suppose that must come via Zambia. If you have another source please let me know. Then, to go back a while, to “earworms” and loneliness; among the scores if not hundreds of cassette tapes that I acquired during the 70s under American influence in Saudi Arabia I have Simon and Garfunkel’s Greatest HIts, which on reading your blog I immediately played to hear again The Sound of Silence; but also Mrs. Robinson, I am a Rock and Bridge over Troubled Water. The cake was utterly, deliciously sinful! But there, I’ve confessed it! The Malawi tea is from Zambia but do say if you’d like some sent I will arrange it for the next trip. In fact, I will just arrange it. I am going to try and find somewhere anyway – Marks & Spencer have a lovely loose leaf Rwandan black tea that also has some safflower petals in it – perhaps my favourite. Yes, Simon and Garfunkel were, I think, rather more political than many gave them credit for – thinking only of their beautiful melodies. I loved them – and have several of their albums – vinyl – which I still listen to occasionally at the weekend – with a red wine accompaniment! Forgot to mention, I’d come across the name Gilbert O’Sullivan but never heard him, so thanks for that. I lke what I heard and he looks nice. I also of course have Yellow Submarine, again on tape. I’ve enjoyed reading your visit to Sweden, not alone but with Larry. I’ve had contact more than once in the past with people at Uppsala when looking for papers in connection with African archaeology, which seems to be one of their fields of interest. And thanks for the response about Malawi tea. Yes, Larry knows one of the Africanists there – he’s English, but a later period than Larry’s area of research. . I’ll let you know if I find any locally available Malawi 🙂 Rab’s Classic was always my favourite but Larry couldn’t find it on his last trip.